I love entrelac. One of my first posts on this humble little blog was all about my love for this technique. It may SEEM daunting, challenging even, but oh, it’s not. The small squares knit up fairly quickly making it a very satisfying technique because you feel like you’re making quick progress. Long story short, entrelac is fun. Give it a try. A number of months ago, I was lurking on the Ravelry forums, and I added my two cents* regarding making a ‘garterlac’ baby blanket. I put my needles to work with making such a blanket in early 2015. I didn’t really re-invent any wheels when I improvised this project, but someone encouraged me to write the pattern out, so here is my pattern. Please note, it has NOT been test knit or edited or anything else fancy. These are my ramblings of a pattern I ad-libbed two years ago. Credit must be passed along to Criminy Jickets as I followed his basic garterlac construction from his Garterlac Dishcloth, a wonderful intro to the Entrelac technique, and one can never have too many dishcloths. When I’ve used the wording from the Garterlac Dishcloth, it is denoted with the text in italics. On my example, photo above, I repeated row (2) SEVEN times, and I repeated row (3) SIX times. My example resulted in the cast on and cast off edges being the sides. Once you understand the basic construction of entrelac, you can adjust this structure for your purposes (i.e., if you cast on a smaller amount of stitches, you could work more rows (2) and (3) and essentially get a blanket with the same dimensions). Each square is made with 8 stitches being worked. K 1, turn, K 1, turn. K 2, turn, K 2, turn. K 3, turn, K 3, turn. K 4, turn, K 4, turn. K 5, turn, K 5, turn. K 6, turn, K 6, turn. K 7, turn, K 7, turn. Repeat the steps for ‘Bottom Triangle’ 9 more times (10 triangles created total). Turn. K 1, turn, K-FB, turn. K 1, SKP, turn, K-FB, K 1, turn. K 2, SKP, turn, K 1, K-FB, K 1, turn. K 3, SKP, turn, K 2, K-FB, K 1, turn. K 4, SKP, turn, K 3, K-FB, K 1, turn. K 5, SKP, turn, K 4, K-FB, K 1, turn. K 6, SKP, turn, K 5, K-FB, K 1, turn. K 7, SKP, do not turn. Pick up 8 stitches along the side of the previous row, turn. Repeat between the *s another seven times, but do not turn at the end of the eighth repeat. Pick up 8 stitches along the side of the previous row, turn, K 8, turn. K 6, K2tog, turn, K 7, turn. K 5, K2tog, turn, K 6, turn. K 4, K2tog, turn, K 5, turn. K 3, K2tog, turn, K 4, turn. K 2, K2tog, turn, K 3, turn. K 1, K2tog, turn, K 2, turn. You are left with one stitch on the left hand needle. Transfer the one stitch to the right-hand needle. Pick up a further 7 stitches down the side of the previous row so you have 8 stitches in total, turn, and continue with the directions for Square. Make 10 squares. Pick up 7 stitches along the side of the previous row, turn. K 6, K2tog, turn, K 6, SKP, turn. K 5, K2tog, turn, K 5, SKP, turn. K 4, K2tog, turn, K 4, SKP, turn. K 3, K2tog, turn, K 3, SKP, turn. K 2, K2tog, turn, K 2, SKP, turn. K 1, K2tog, turn, K 1, SKP, turn. Repeat the directions for Top Triangle 9 more times, until all stitches have been bound off. Block if appropriate for the yarn. *hmmm… we no longer have pennies in Canada that I could have contributed…. I added my five cent piece, then? From the first time I tried it, I fell in love with entrelac. If you haven’t tried this technique yet, I ask why not? First, what is it? Entrelac is a technique in knitting where it looks as if the fabric is interlaced. Appropriately, when translated from French, entrelac means interlaced. It gives a lovely woven appearance, and it looks as if it’s more difficult than it actually is. There are fantastic tutorials available on how to go about knitting this technique. 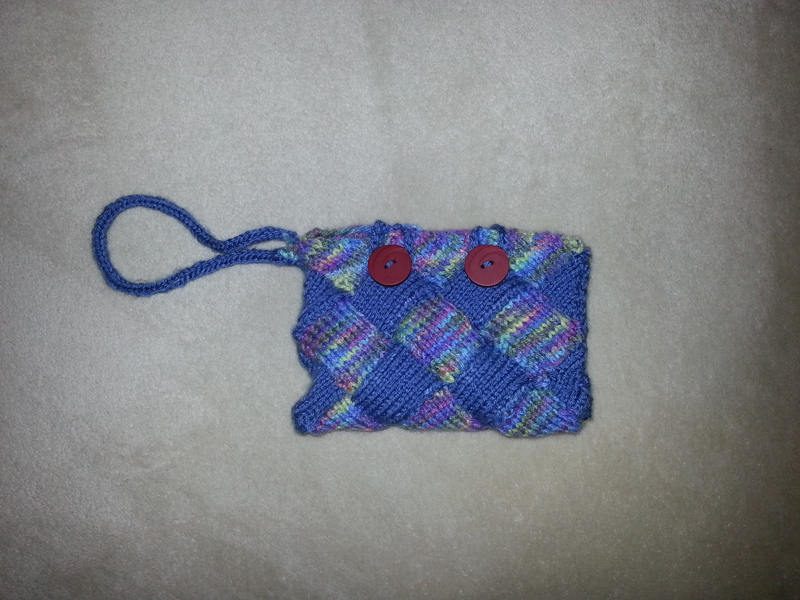 My first foray into entrelac came with the above clutch. I decided to get fancy and use two different yarns for this project (as if learning a new technique wasn’t challenging enough). It was also a perfect way to use up the last of my Red Heart Super Saver (first yarn I ever bought), and another yarn, which I just can’t remember where or when I bought it. It knit up surprisingly fast, and a fast project is always satisfying. The project called for the i-cord wristband, but I added the chained loops and buttons to act as a closure. I also had ‘fun’ (fun used rather loosely), adding a fabric lining using a sewing machine. Sewing machines and I don’t always see eye to eye. We have a history. This was a battle I won, and after a few trial and errors, the lining was added and it adds a fun pop of colour to the inside (and bonus, it is wide enough to fit my phone and a set of keys – only the important items). I really wish I could have shared the link to this pattern, but when I went to add it, I discovered the link didn’t work. It was a Seattle Yarn pattern. I’ve also thoroughly enjoyed knitting a ‘garterlac’ washcloth for my sister, garterlac because it is made with the garter stitch. Lots of knit stitches, no purls. That’s okay in my books. 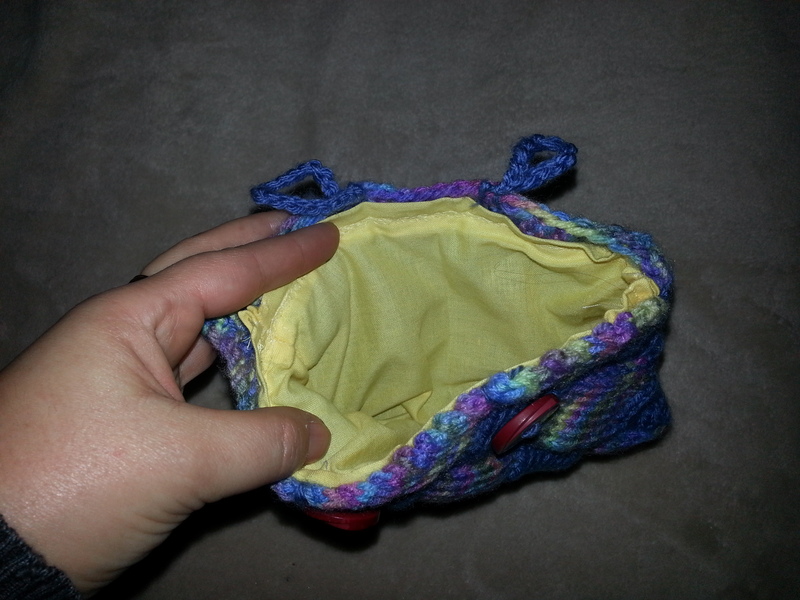 The pattern I used was from Criminy Jickets, and like the clutch, it was a fast and satisfying project. I would have loved to share a picture of this, but my sister’s inquisitive kitten decided the washcloth was hers to chew on. I encourage you, find an entrelac pattern and give it a try! Surprisingly simple, a fast fun knit. Allons-y!